Originally a cassette-only album release, the first following the departure of Ian Craig Marsh and Martyn Ware from the original Human League line-up. 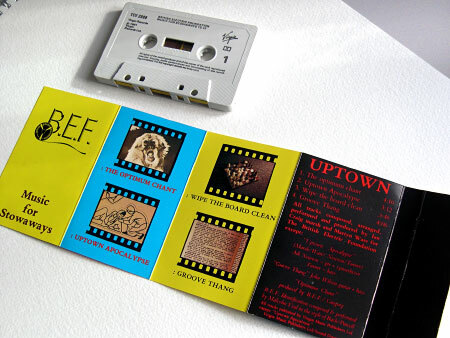 1980/81 saw the cassette as a format very much in-vogue, with other acts such as Bow Wow Wow making much publicity from cassette-only releases such as ‘Your Cassette Pet’. This was all no doubt fuelled by the revolution that was the Sony Walkman, first introduced in 1979. 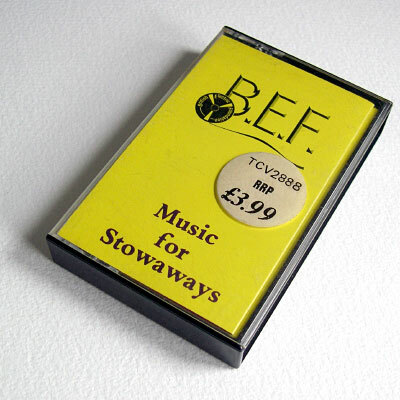 The title of ‘Music for Stowaways’ came from Sony’s originally planned UK name for the device, the Stowaway, but what would eventually be the Walkman. As well as the cassette, white label promo vinyl pressings also exist. ‘Decline Of The West’ also appeared on vinyl as it was the B side to the first Heaven 17 single ‘We Don’t Need This) Fascist Groove Thang’, released at the same time on 7″ and 12″ as the ‘Music for Stowaways’ cassette (and some years later the single also appeared on a 3″ CD single too). Some while after the original cassette issue a vinyl LP called ‘Music for listening to’ was released, pressed in the UK but for export abroad, and featured five of the tracks from the cassette as well as a new piece, ‘A Baby Called Billy’. 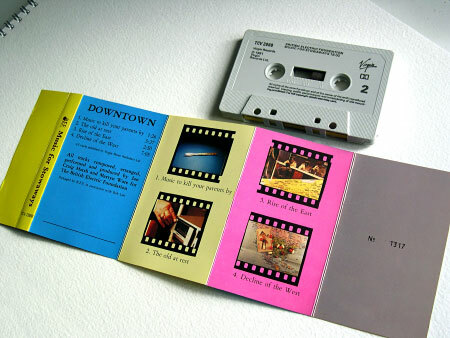 The original cassette was a numbered limited edition, but there was a later re-issue of the cassette (Virgin, OVEDC 230). Much later, in 1997, a CD release in America gathered all the tracks from the cassette and the vinyl LP together, detailed in the next post, and was also titled ‘Music for listening to’ and adapted the sleeve design from the LP. The track ‘Wipe The Board Clean’ dates from the pre-Human League era when the band recorded as The Future and a different version, going under the name of ‘Titled U.N.’, can also be found on the 6-track 12″ EP (Black Melody, MEL3) released at the same time as the ‘Golden Hour of the Future’ CD in 2002. ‘Decline of the West’ and ‘Groove Thang’ have also appeared on the 2006 CD re-issue of ‘Penthouse and Pavement’ by Heaven 17 (Virgin/EMI CDVR 2208 / 0946 3 66802 2 4) along with ‘Honeymoon In New York’, a track that first appeared on the B side of Heaven 17’s ‘The Height Of The Fighting’ single and which is very similar in style to the contents of ‘Music for Stowaways’ – it would definitely be at home on a future re-issue of ‘Music for Stowaways’, should there ever be such a release. This entry was posted on Monday, March 31st, 2008 at 1:40 pm	and is filed under Cassette pets. You can follow any responses to this entry through the RSS 2.0 feed. You can skip to the end and leave a response. Pinging is currently not allowed. what you can asked me….